Day 3 and 4 of the trekking adventure in Torres del Paine in Chile. 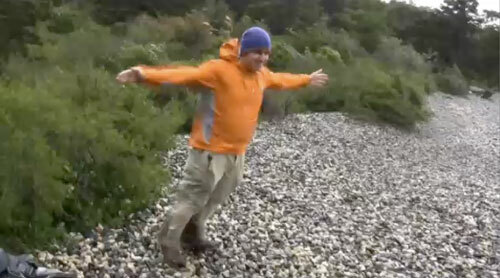 Sam shows warning signs of hypothermia and William makes a decision about continuing the journey. I'm glad to see that the culmination of the Torres del Paine saga ended with my favorite E.S. Posthumus song, Oraanu Pi, yeah it ain't Nara, so get over it William. What an amazing adventure. Glad I new the outcome before I watched it. Love you guys!! Wow...I am SO proud of you guys. I am spreading your website to all my kids, their friends and my family. We are all enjoying your adventure!!! God's blessings! great. if i'd have known you guys would be sleeping in t-shirts in the snow and walking around in those dangerous winds i wouldn't have let you go. BE CAREFUL! love you! Excellent stuff. Your vids just keep getting better and better. The video geek in me wants to know though, what camera are you using? What sort of grunt has the laptop you're editing on got and what app are you using to edit? Anyway, whatever you're doing keep it up. What an awesome vid! I'm really living vicariously through you guys. Miss you both and wish I could be there to share the bad porridge and badly sing Sheryl Crow songs. @David: Miss you too man! Thanks Sam, I missed that post. Wow, neat little camera. Canon optics are superb - I miss my old Hi-8 camera for that reason. Your pictures are awesome. The solid state stuff really has come of age in the last 12 months or so since I bought my HD camera - I'm stuck using tapes for a while. Wow, watched your 3 Patagonia vids. I'm headed there in Feb for the W. Hope the weather is better for me! What refugios/camps did you stay at? thx!